A “cohort” is a group of people that share a certain characteristic—usually, but not always, based on a specific action they carried out within a specific time frame (for example: everyone who shopped for the first time in February 2016). Cohort analysis refers to the practice of studying the activities or habits of specific cohorts over a set period of time. It's a bit like segmentation, but focusses more on historical data—using it to spot patterns or changes in consumer behaviour throughout the customer journey. 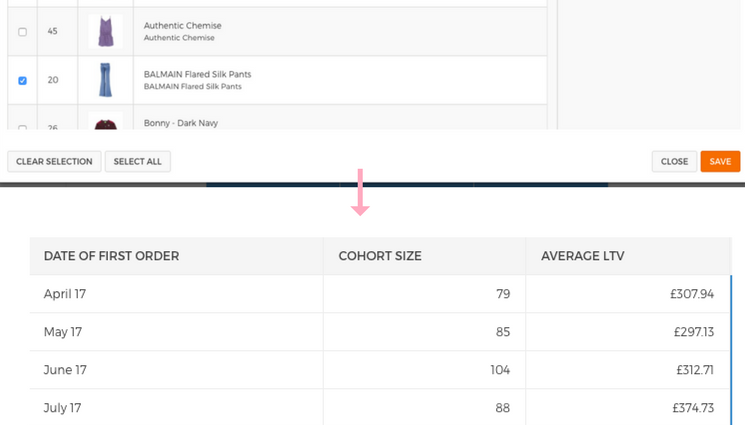 For ecommerce marketers like yourselves, cohort analysis is a unique opportunity to judge the direction a brand is going in and spot early on what works and what doesn’t. It can also enlighten marketers as to which cohorts (i.e. groups of customers and/or contacts) are the most valuable to your brand. What to define a cohort by: As well as time specific (e.g.“date of first order” or “date subscribed”), other examples include grouping customers by demographics (e.g. gender), campaign source, channel source or lifecycle stage. Which metric to apply to this cohort —i.e. the customer/contact activity you want to measure: This could be: “Total revenue”, “Customers repeated”, “Total orders”, “Average order value”, and so on. The time span in which to measure the analysis: We tend to look at activity on a monthly basis, covering 6-12 months. 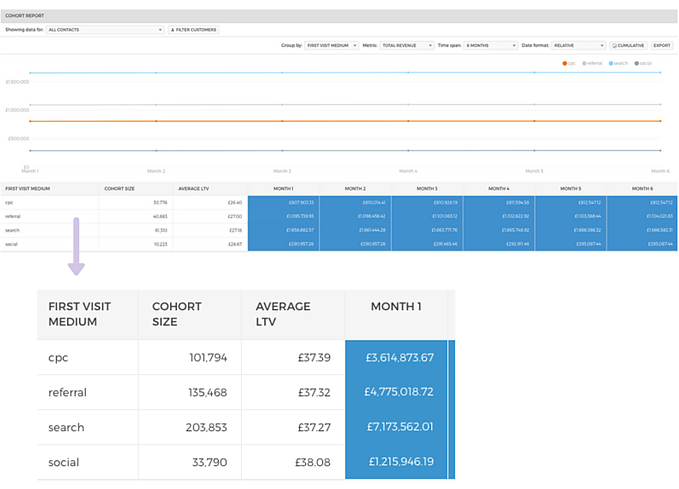 Using a platform like Ometria, you can start using cohort analysis pretty much straight away (as it does all of the tricky manual work—like pulling raw customer data, exporting it to a spreadsheet, defining the cohorts and calculating correct dates etc—for you). All you have to do is set the rules for the cohort you want to analyse by choosing the three things mentioned above: “group (contact) by”, “metric” and “time span”. In this post, we include screen grabs from our “cohort reports” functionality to help you visualise how the analysis works. 1) Is my new marketing campaign converting leads into customers? 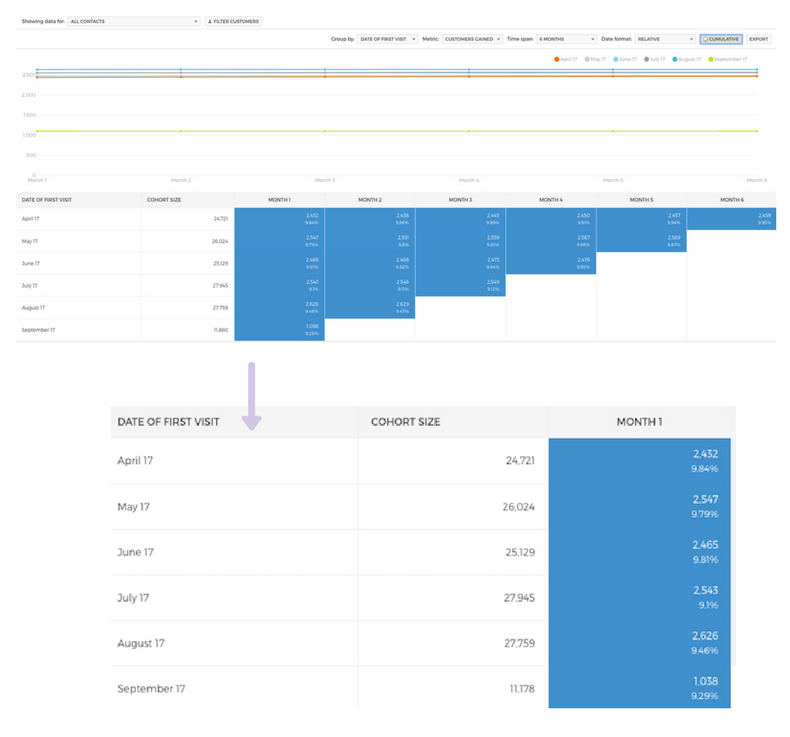 You can use cohort analysis to monitor the performance of your marketing campaigns over time and see which seem to convert the most leads (contacts for whom you have an email address but have not yet shopped) into customers, and in what time frame. You can do this by grouping your contacts according to, for example, “date of first visit”, and then looking at a metric such as “customers gained” and apply a time span of, say, six months. The report will then show you, month on month, the number of customers gained from that initial group of contacts. In this example, we can see that this brand’s acquisition strategy is strong, with an impressive number of customers converting in the first month for pretty much every cohort. That said, we can also see that the April 17 cohort converted slightly less customers within its first month than the following cohorts (i.e. those who first visited the site in May, June, July 17 etc…). This test is a great way to analyse whether or not, each month, you are managing to convert more customers on their initial visit (or, if you’ve implemented a website change that isn’t working properly, less customers). This type of cohort analysis can also reveal how long it takes your customer cohorts to convert; for example, if you're a luxury retailer with contacts that like to really think their purchases through, you may notice no conversion in month 1, but a large amount of conversion in month 2,3,4,5 or 6. 2) Do I need to invest more in retention? To discover whether or not your brand needs to invest more in its customer retention strategy, you could group a cohort by the week/month they were first acquired, and then measure the revenue made from that group over the following 6-12 months. On a granular level, changes within the spending habits of each cohort month on month can be identified using a test such as this. Looking at the analysis more broadly, the May 17 cohort has a higher lifetime value (LTV) than April 2017. This could be indicative of a particular campaign, event or product introduced in May, which resulted in a spike in spending habits and an increased level of customer loyalty. This retention test could also be carried out using the same cohort (“date of first order”) but the metric “repeat customers”. 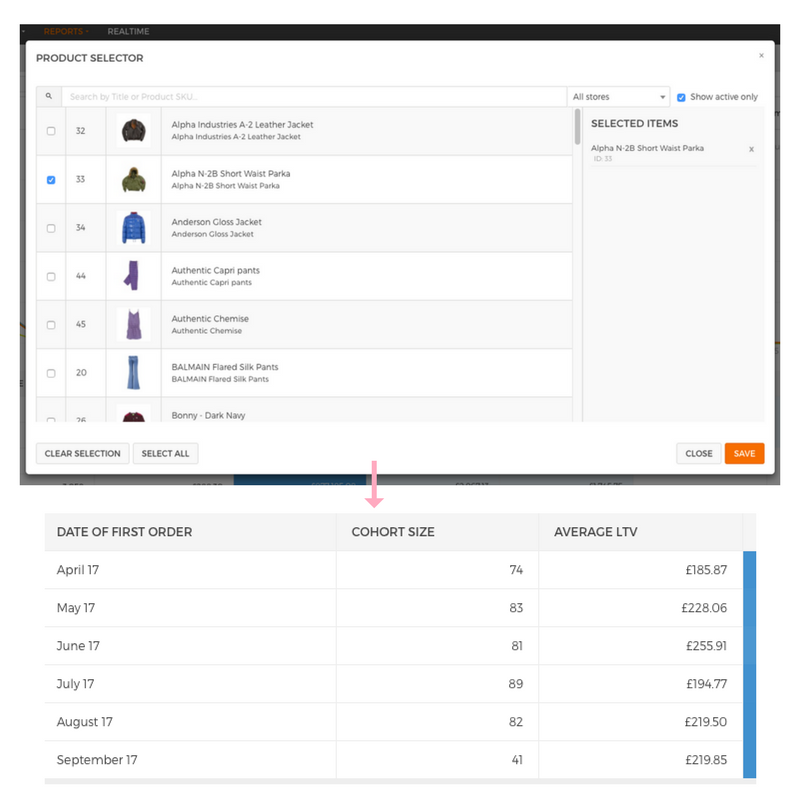 N.b.If you find that the total revenue month on month (or number of repeat orders) does not increase at all, it may be that you could be doing more to keep new customers engaged following their first purchase, for example, by implementing a post-purchase strategy to get them shopping again. Bonus point: To take this test (or any test) up a notch, you can filter your cohorts according to specific criteria (for example, all of your VIP customers) and then run the same test. This enables you to look at people who are (e.g.) VIPs today *and* first shopped in month [x], and observe the sort of purchasing behaviour they displayed in the past that resulted in them reaching that status. 3) Is each stage of the customer lifecycle being nurtured enough? On the back of the point above, you can actually define your cohorts by lifecycle stage to spot patterns in how contacts interact with your brand before they become (e.g.) loyal customers or, conversely, lapsed. For this test, using a time frame of 12-24 months is best, as it takes around eight months of no activity for a customer to be deemed “at-risk” of lapsing. This test should give you an idea of how you can pay more attention to certain stages of the customer journey to prevent customers from becoming disengaged. For example, by grouping customers by “lifecycle stage” and using the metric “total revenue” over a time span of 12 months, you might find that, for active customers, the first six months after being acquired is when they are the most valuable. Or, for your at-risk cohort of customers, around month seven is when they tend to stop shopping completely. Other good metrics to use for this test include: “average order value” and “customers repeated”. The example below groups customers by “lifecycle stage”, using the metric “average order value” and a time span of 24 months. ... 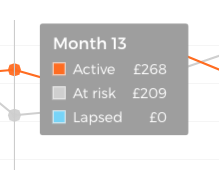 Whereas the average order value of those “active” (orange) steadily increases, the AOV for those “lapsed” (blue) becomes completely stagnant around month 13: Ultimately, cohort analysis can highlight more subtle improvements or deterioration in your lifecycle marketing, which would manifest as incremental, but consistent, changes to (e.g.) that cohort’s lifetime-value. 4) What are the long-term purchasing habits of different demographic segments? Your cohort doesn’t always need to be defined by a specific action or event; it can also be based on demographic information, such as gender or country. By grouping customers by (e.g.) “country”, and measuring the “total revenue” made each month in that location, you can see whether there’s a big difference in the purchasing habits of, let’s say, France and Belgium. Using this information, you can learn country-specific elements about the lifetime value of customers. 5) Which channels are driving the best results? The below example groups customers by “first visit medium”, using the metric “total revenue” (within a time frame of six months). In this example, we can see that, whilst the “search” cohort is the biggest in size (and is generating the most revenue in total), customers within the “social” cohort (which is much smaller) have a high lifetime value. In-turn, this information can help marketers understand which channels are best to invest in for long-term success (and which are bleeding them dry with little to show for it). 6) Do I have many seasonal shoppers? By grouping your customers by “date of first order” and using a metric that looks at either the “total orders”, “total revenue” or “customers repeated”, marketers can also identify seasonal shoppers who shop around November but then disappear for the next eleven months. Another way to find out who your gift shoppers are is to measure the number of customers gained in December compared to the number of customers gained in, for example, March and see if it makes a big difference. If you find you do have a large cohort of gift-shoppers that spend a lot with you during the festive season but then drop-off, you could invest in a January/February themed campaign to keep them around. 7) Are those subscribed spending more than those unsubscribed? You invest a lot of time and energy in your newsletter pop-up asking for sign-ups, and even more in making your newsletters awesome, but are your subscribers actually spending more than those unsubscribed? Define your cohort by “subscriber status” and use the metric “total revenue” or “orders made” to find out. The result might be that those subscribed *do* stay highly engaged, which will affirm the value of your broadcast emails. It might also show some changes, suggesting certain monthly newsletters do better than others. If your subscribers seem to be not spending much at all, that doesn’t necessarily mean you shouldn’t be sending newsletters; it might be indicative of poor content that needs revising, or frequency issues, or might just show that your newsletters are simply a brand awareness exercise that keeps people aware of who you are and the products you offer. After all, in 2017 content is a long-term asset to have. 8) Different stores, different results? Last but not least comes the question of whether different stores are producing different results for the overall company. By breaking down your customers by store, you can figure out what the lifetime value is per particular shop. This could be offline, or for different websites; for example, your .fr store may be performing way better than your .uk store. This analysis can also be used to see different offline results for different stores you have within the same country. If you wanted to carry out smart cohort analysis at an even more granular level, you can. 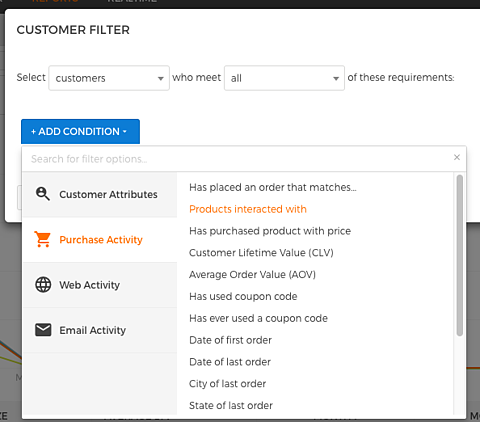 Using the Ometria platform, you can filter your contacts by “purchase activity” and select a specific product in order to see the average LTV of its customers over time, and perhaps compare it to another product. For example, below is an analysis of a) coat shoppers and b) jeans shoppers, revealing that, overall, jeans tend to have a higher LTV. Got any of your own questions? Ultimately, cohort analysis is a fantastic way to look back and analyse the performance of your brand over time. Once you have carried out an analysis, you can export a cohort report to look at and share in more depth. We understand that cohort analysis is difficult to get your head around, so if you have any of your own questions please don’t hesitate to get in touch or drop up a comment in the section below.